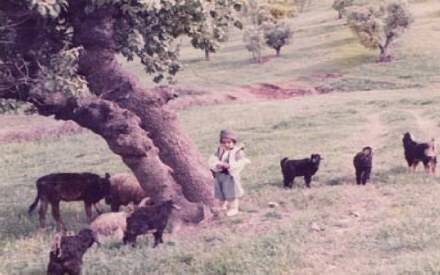 This little Kurdish boy, in the postcard above, posed as a shepherd, dressed in a traditional Kurdish cloth. Such type of cloth mostly are worn in the Sorani parts of Kurdistan, especially in the mountainous areas of Hawraman and north eastern part of Kurdistan in Iran. The vest like over top which is called " Faranji " with two extensions on the shoulders are made of pressed sheep wool. This type is mostly used for less severe weather by ordinary people. But nowadays, some people use it in Kurdish events and anniversaries like New Year " Newroz " and other celebrations as s symbol of Kurdish dress. There is another type which covers most of the body and reaches down the knees are used by traditional shepherds and some farmers in the areas where snows too much in winter. The long socks are also made of sheep or goat wool which wraps around the bottom of the Kurdish baggy pant " Sharwal ".